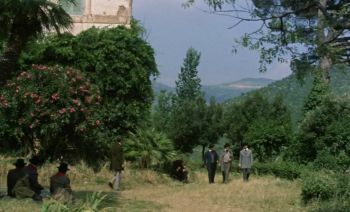 Comparison between the US Version and the uncut Italian Version (both available on the UK Blu-ray by Arrow Academy). 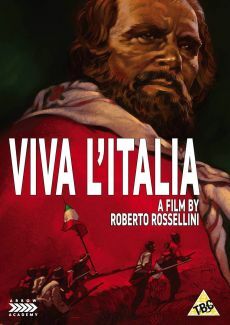 "Viva l'Italia" shows how guerilla fighter Giuseppe Garibaldi contributed to the unification of the Italian Empire by conquering Sicily and Naples in 1860 in a military campaign of volunteers, known as the "Train of a Thousand". 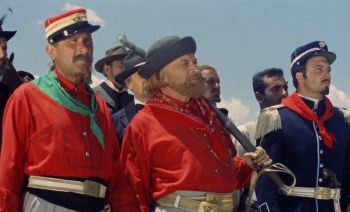 Roberto Rossellini staged Garibaldi's conquest as an rampantly epic movie with multi-layered political references that might overwhelm the average viewer. 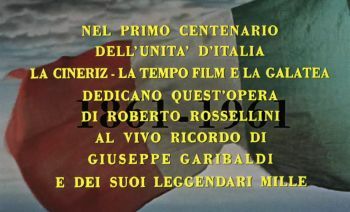 I therefore recommend that anyone who wants to watch the movie but has no deep understanding of the history of Italy, especially of the 19th century, first read the Wikipedia entries on Giuseppe Garibaldi and the Train of a Thousand. An extensive visitation of the library or a history study would be likewise from advantage. 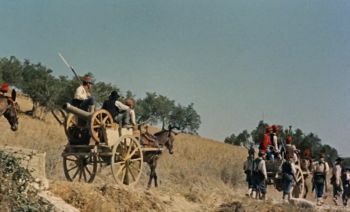 But even if you're a bit lost at some points, the film offers opulent battle scenes as a substitute, so that fans of historical epics will certainly enjoy the film. 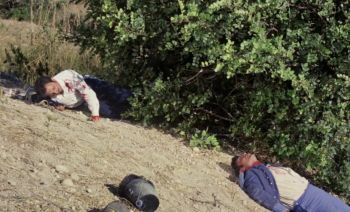 The uncut version has a running time of 128 minutes, which was probably too long for the US distributor. 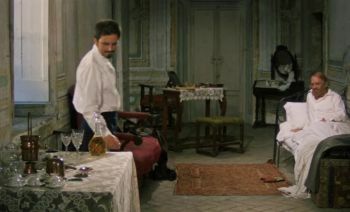 The film was cut by 44 minutes to a running time of 84 minutes. 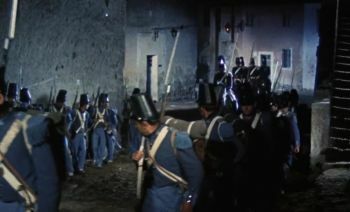 Mainly parts of the story and also a few battle scenes were removed. 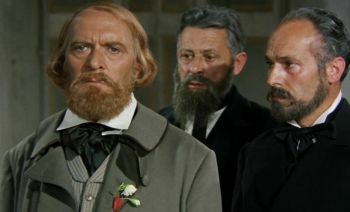 Thereby of course many aspects of the movie get lost, as some side plots were completely removed or strongly shortened. 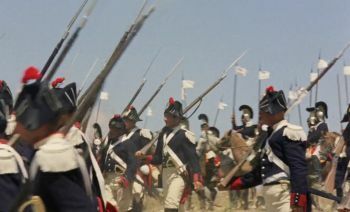 Therefore, I recommend the historically interested viewer to have a look at the long version but if you want to see a somewhat swifter conquest-movie instead, you should rather go for the US version. Since Arrow makes it possible to watch both versions in the same good quality, the viewer has the choice. 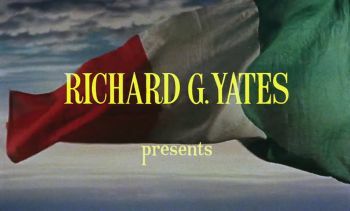 The US version begins with an english opening credit. 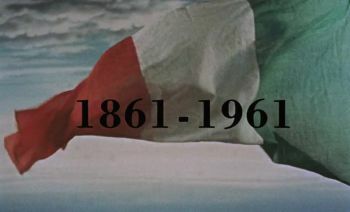 The Italian version begins with a thank you note, followed by much longer opening credits. The explanation of the territorial conditions at the beginning starts somewhat earlier. In the US version the original title is missing. The IT version shows another image. 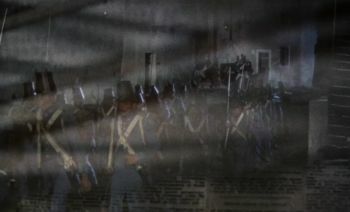 The narrator says that the revolutionaries are waiting for the signal. 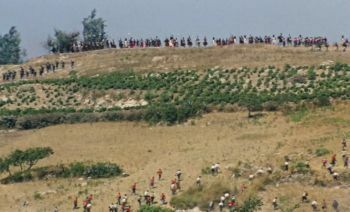 The cops ask where the driver picked up the people. He replies that he took them from the station and that one of them was an officer. 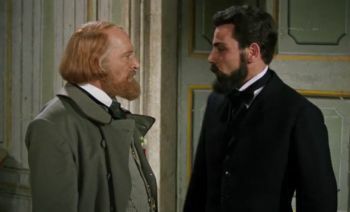 Garibaldi goes to bed and apologizes that he has nothing better to offer for his guest. Bandi lies down slowly. 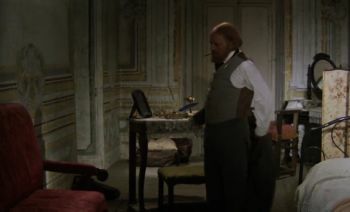 Bandi gets up the next morning to make coffee for Garibaldi. They both realize that they slept well. 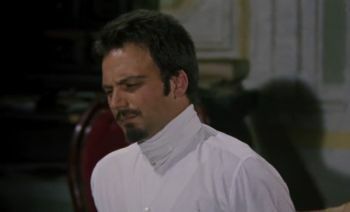 He should call Fruscianti so that they can walk in the hills and furthermore find new clothes for Bandi. 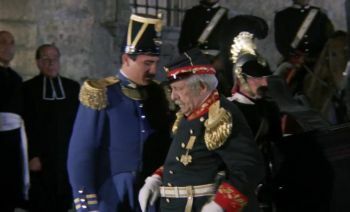 Bixio tells the general that Farina has arrived from Turin. 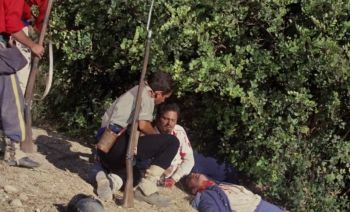 Another man walks up to him and says that Crispi is back too, but without rifles. 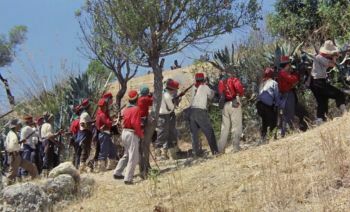 The guns were confiscated because of political machinations. 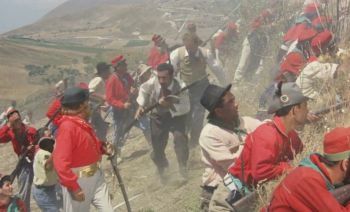 The men also want to go out without rifles. 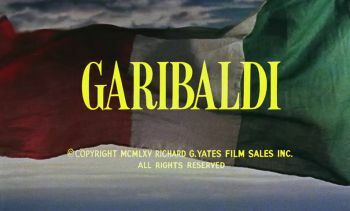 Garibaldi's meets Farina. 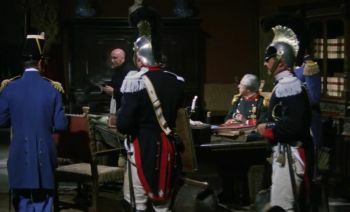 He tells him that after an audience with the king he should have received the Bergamo Brigade but the king had decided otherwise two days later. Farina is to clarify the matter for him. 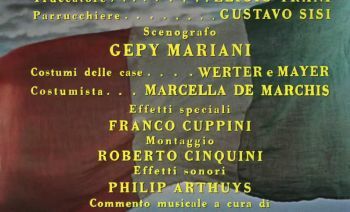 He definitely wants to help his brothers in Sicily. 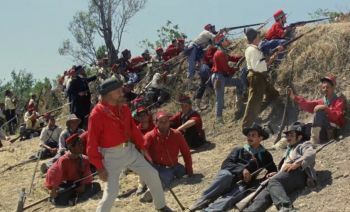 Farina says that it is not possible to get rifles because he does not want to support civil war. 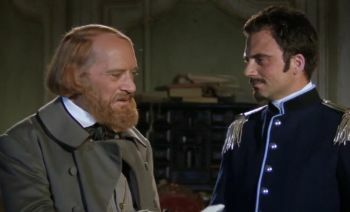 Garibaldi receives a telegram from Malta, which speaks of a total defeat in Palermo. Farina then promises him support in the form of rifles. 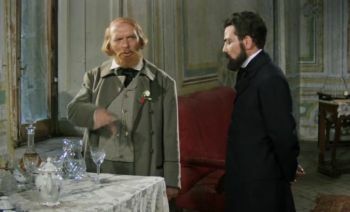 Garibaldi straightens his things when he receives another telegram from Fabrizi. 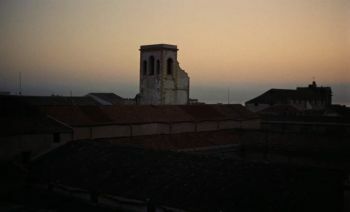 The uprising in Palermo was suppressed. 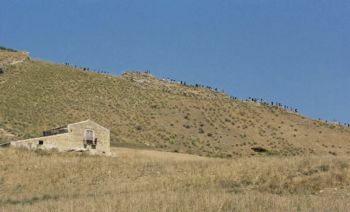 They retreat to the countryside. 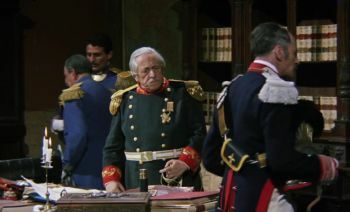 Garibaldi wants to leave immediately. The newspaper fades over to the marching soldiers. 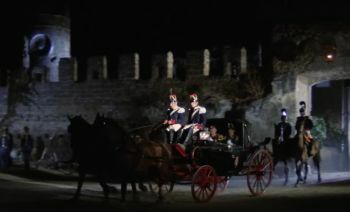 The general drives up with the carriage, gets out and asks the provost to speak. 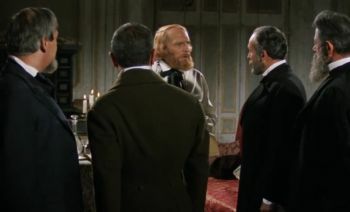 The mayor says that he cannot come out because the doctor has forbidden him to do so. 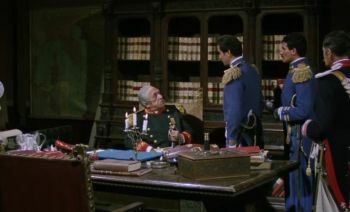 The general's things are taken to a room. 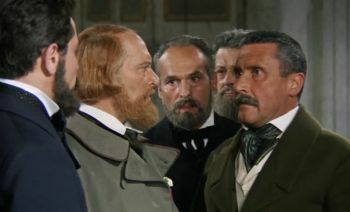 The mayor tells the general that he doesn't know exactly where the insurgents are but suspects in Marsala. 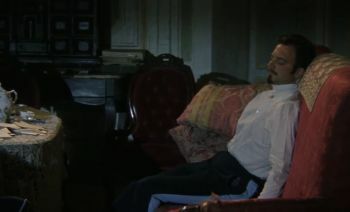 Major Sforza enters and says that he was sent to support him in the fight against the insurgents. 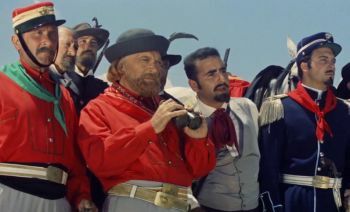 However, the men are unsure where exactly Garibaldi is supposed to be. 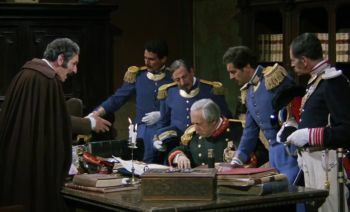 The "Captain of Arms" Natale Scimeni is called in the hope that he knows where the rebels are. The US version doesn't start until he introduces himself to the provost. 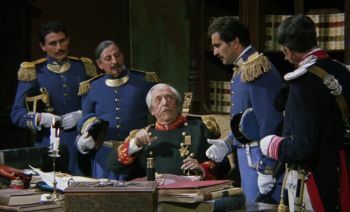 Natale explains to the general that the peasants have joined forces and he has some information about it. 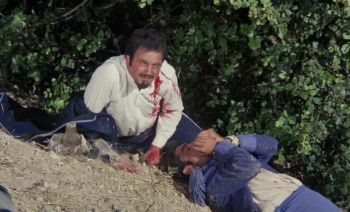 The general thanks him for this, then sends him away. 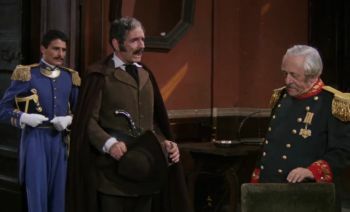 The general thinks that if Garibaldi wants to go to Palermo, he will only succeed if he marches through Calatafimi. There he wants to build a defensive distribution line. 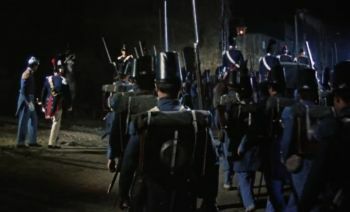 The soldiers don't understand why they should be in the defensive against such a bandit. 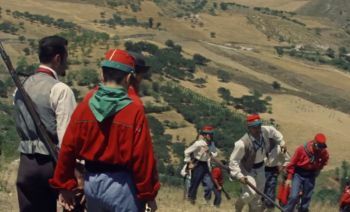 The general thinks that this has to do with the mood and reputation of Garibaldi among the population. 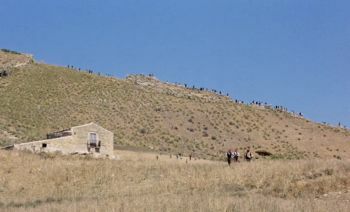 He then sends the soldiers away. 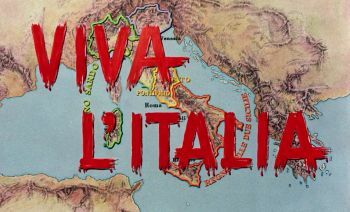 Natale further reports how his men observed that the rebels marched to Vita. 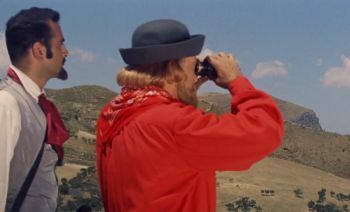 Garibaldi gets a pair of binoculars and watches the men. He sees the civilians fleeing. 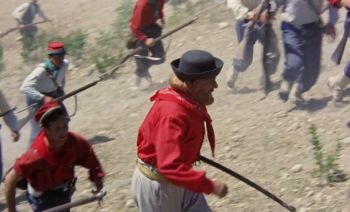 Garibaldi thinks that they have to fight to show the farmers who they are and to get them to join them. 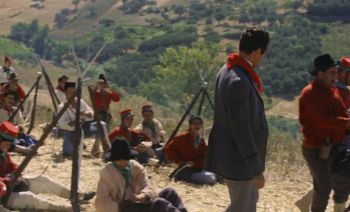 A man says that the Bourbons from Calatafimi move out to meet with them. 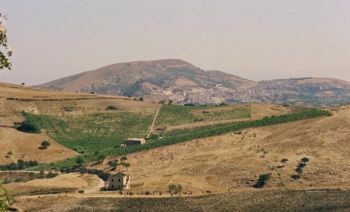 They take a stand on the nearby hill "Pianto Romano". 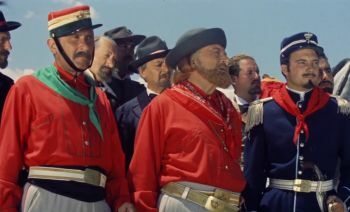 Garibaldi starts a patriotic song and sets off. 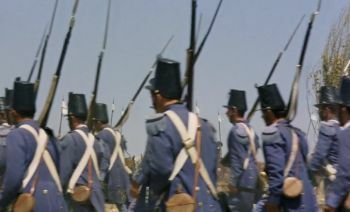 The troops also set themselves in motion. 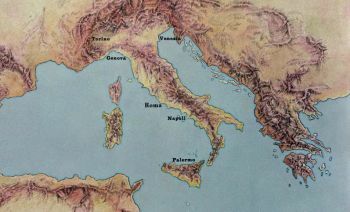 Bandi says that he told Garibaldi that the Bourbons were taking a stand on the "Pianto Romano". He orders people to eat while there's still time. 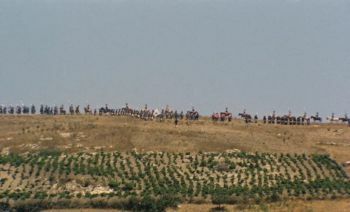 The camera pans to the hill with the troops. 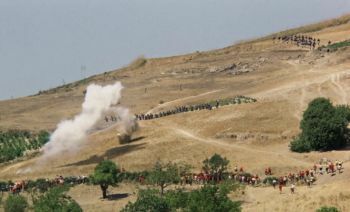 The camera pans over the hill and shows more scenes of the battle. 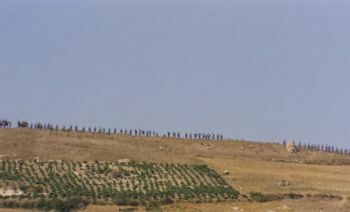 The soldiers are marching. 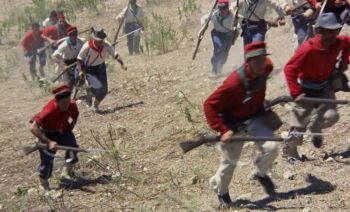 Garibaldi sends some soldiers forward. The US version doesn't reinstate until the soldiers throw the stones. 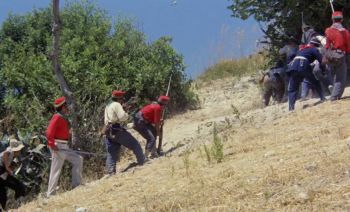 Garibaldi storms forward together with the soldiers. 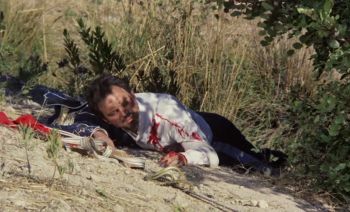 One of the injured soldiers calls for a priest. 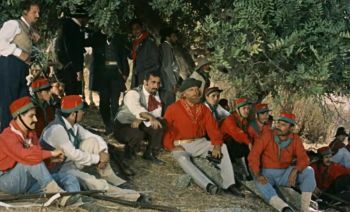 A soldier tells Garibaldi that the Sicilians are coming to support him. One of the injured soldiers gets a lemon to quench his thirst. 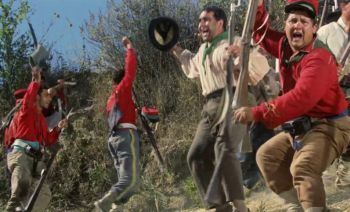 More soldiers are motivated by a patriotic song. Short cut on the injured soldier eating the lemon.